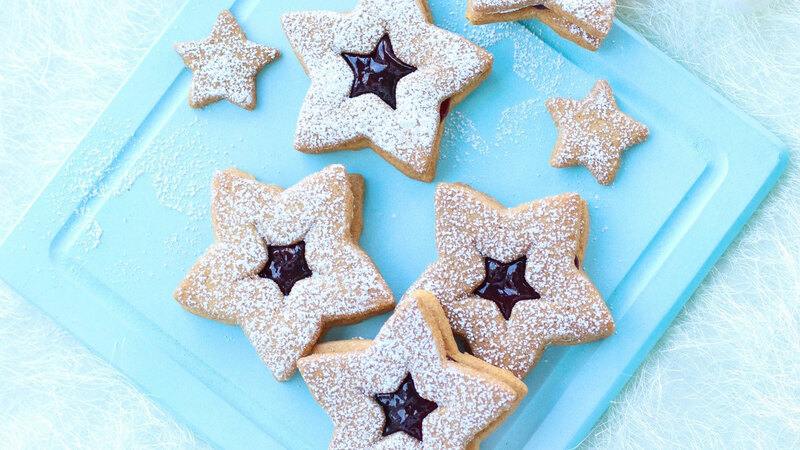 Jammy dodgers are always an impressive looking treat but relatively easy to make. Of course kids are going to love to be involved in making them, especially when it comes to the jammy centre. Use any shape stamper you like for the centre. They look equally good with a flower, square or even a circle as the centre. 1. Place the flour and butter in a food processor and blitz to fine crumbs. Blend the icing sugar through and then with the machine running, add the egg yolk and vanilla essence. Blend until the mixture comes together in a soft dough. 2. Dust a surface with a little flour and knead the dough into a smooth ball. Flatten it down into a disc shape, cover with cling film and refrigerate for about 30 minutes until firm. 3. Preheat the oven to 180C (fan 160C), 350F, Gas Mark 4. Line two large baking sheets with baking parchment. 4. Roll the dough out on a lightly floured surface, to about 3mm thick. Using a star cutter, which is about 8cm at the widest point from tip to tip, stamp out 24 stars, re-rolling the dough as necessary and arranging them spaced apart on the trays as you go. Then, using a star cutter, which is about 4cm at the widest point from tip to tip, stamp a star shape from the centre of 12 of the stars. Carefully remove the small, inner stars and arrange them around the trays also. Chill in the fridge for 15 minutes. 5. Bake for 12-15 minutes until cooked through and lightly golden. Remove and leave to cool on the trays. 6. Place a teaspoon of the conserve in the centre of each of the biscuit discs as the base of the Jammy Dodger. Dust the star cut out discs evenly with icing sugar and press one down on top of each base. Dust the stars with icing sugar also and serve. Tip: Use our strawberry, raspberry, blackcurrant or apricot jam instead of the conserve. Our own brand chocolate spread would be equally delicious too!